Lawrence Welk Trumpet Player Earned Nickname "Ironlips"
Norman Bailey was a trumpet player in the Lawrence Welk orchestra from 1952 through 1973. Bailey was born in 1913 in Worcester, Massachusetts and joined the Freddy Martin Orchestra in 1934. After taking a career break in 1951 to work for Northrup Aircraft, he joined the Welk Orchestra in 1951. Two of his most notable songs were "Sugar Blues" and "Hot Lips." 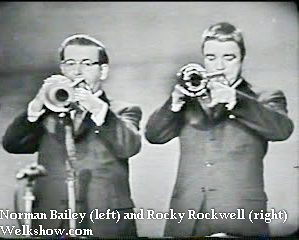 Bailey formed the core of an impressive group of trumpeters in the Welk Orchestra during the late 1950's which included Rocky Rockwell, Woody Guidry, Art Depew and Warren Leuning. Welk nicknamed Bailey "Iron Lips" because he never got tired. Bailey could easily be spotted in the trumpet section because of his dark rimmed glasses. After leaving the Show in 1973, Bailey retired and passed away in 1984 at the age of 71.